The demands of contemporary life, both real and self-imposed, overload our minds with an internal dialogue that hinders creative engagement with the physical environment. Compounding our ability to engage with the physical world is an entertainment and media culture of flashing images that commands our attention. Careful observation of the living world in this hyper-saturated landscape of advertising and flashing images is an endangered action. Our children are immersed in this entertainment and media culture. They are the most desirable consumer group, a highly profitable target market from their toddler years into their teens. Bombarded by slick electronic and print images, they are placed in the position of "passive receptor". Hyper-stimulated by video games, they learn the "reactive" position. The intent of my work at Kidspace is to counter this culture by engaging the children in proactive and creative play. Creativity is the greatest asset with which to equip our children to face the challenges of the future. Creativity, born of careful observation, stimulates the mind to ask questions, and exercises the brain as the mind seeks to relate what it is seeing to its past experience. 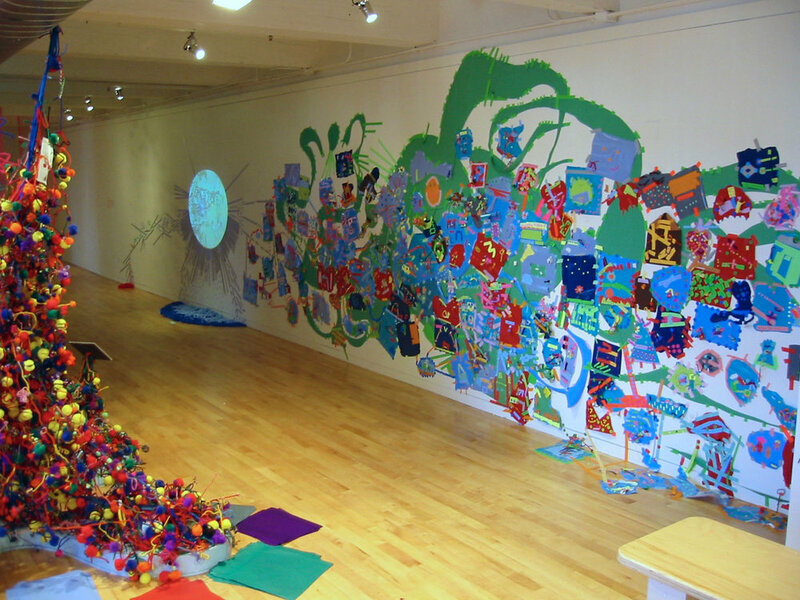 I intend to make careful observation a key part of the installation projects that I do with the children. The sensory appeal of the materials that I use will get the children "into their bodies". 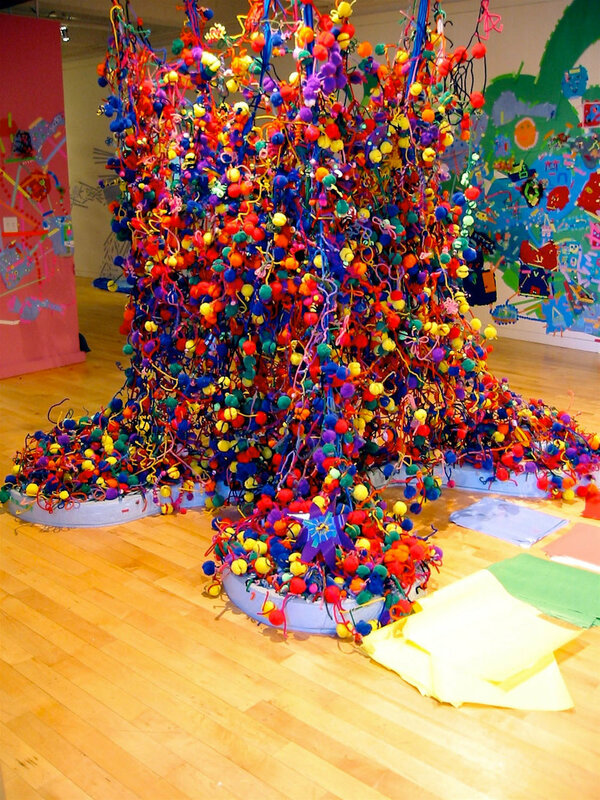 This installation and interactive playspace seeks to open the universe of potential and possibility that exists within each child. This installation exists in the interface between sculpture, drawing and performance. The materials and installation environment trigger my response. The installation is impermanent. It will exist and change in time. 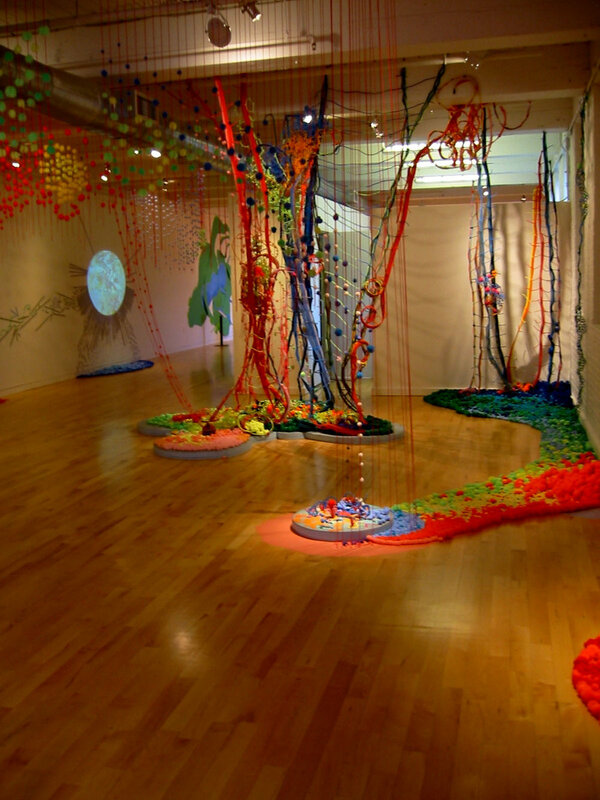 At the end of the show, the installation will be separated back into its component parts so that the materials may be recycled into new forms. The elements are available to form new relationships…new meanings. For this project, the gallery space is divided into two areas. The front space is a rich landscape of color, texture and form. The materials interact with each other in relationships that range from the simple to the complex. The rear of the space is devoted to play and visitors are encouraged to participate. The focal point of the back gallery is a large Styrofoam "island" that will evolve over time with the contributions of the children and parents that visit Kidspace.